We’re pleased to announce that MidAtlantic Bulldog Rescue has been approved for BISSELL’s Partners for Pets program! MidAtlantic Bulldog Rescue is proud to be a Partner for Pets! BISSELL and LostPetUSA.net have teamed up to help organizations like ours raise money, and now you can help too! When you purchase pet products on bissell.com and enter the code ADOPT at checkout, a portion of your purchase will be donated to our rescue. What’s more, every purchase goes towards an entry for us to win a $5,000 quarterly giveaway! · Then select our rescue! The end of June not only means the end of DOUBLE Donations, but it’s also the last month in the second quarter of the year – which means there’s only a couple more weeks to qualify for the next $5,000 drawing! This is the final push to get those redemptions in! Please share the image below (and attached) with your supporters and feel free to use the attached “Cover Photo” for your Facebook page. Remember, any pet product purchased on bissell.com (http://www.bissell.com/pet-vacuum/ for a full list of pet products) is eligible for a DOUBLE Donation to your organization when the ADOPT promo code is entered at checkout. That’s $2, $10, or $20, plus the chance to win the $5,000 Quarterly Giveaway when you’ve had 5 ADOPT redemptions. So, spread the word and ADOPT! 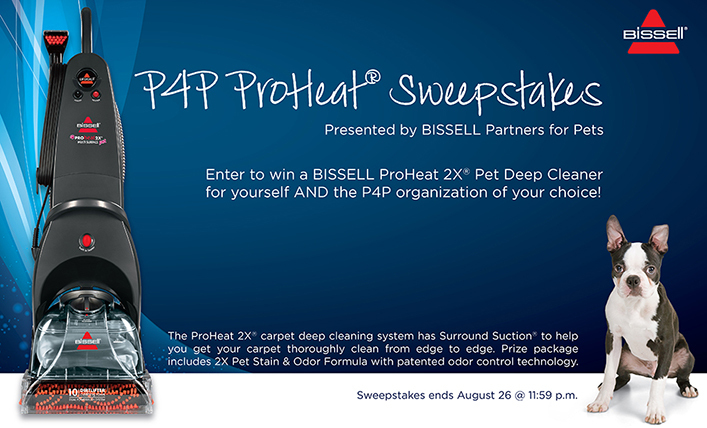 Dear Partners, Only for our Facebook fans – We’ giving away a BISSELL ProHeat 2X® Pet Deep Cleaner and 2X Pet Stain & Odor Formula to one lucky winner and the participating Partners for Pets organization of their choice. The BISSELL Pet Foundation’s 2nd exclusive sale of the year. We are selling our Velocity Vacuum for just $74.99 with free shipping! Enter the ADOPT code for your favorite shelter and they will receive $25! It’s that easy! The sale started this morning and will last until May 27th or whenever we sell out of product. The Christmas in July Giveaway is July 7-13. That’s right! 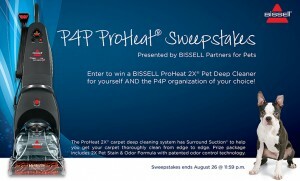 We are giving away $1,000 and our favorite BISSELL products for 7 days! Mark you calendars because Santa Claus could be coming to your town!